If you remember back from some of my earlier instructional TRX blogs, there are certain steps you need to take before starting ANY exercise on the suspension trainer. As always, if you have any restrictions or limitations, always check with your physician prior to starting any new exercise. To begin, adjust your TRX suspension trainer to short length. Your position will be SF, or Standing Facing the anchor point. To start the movement, pull your shoulders down and back and bend your elbows to 45degrees from the body. Walk your feet towards the anchor point until you feel a squeeze in your upper back. Remember, the closer your feet are to the anchor point, the more difficult the move will be. To execute the movement, maintain plank position and lower your body down your arms are fully extended. To return, pull your body towards the anchor point by driving your elbows back to 45 degrees. There are two common mistakes with this exercise that you want to be sure to avoid. One is breaking at the hips. You want to be certain you maintain plank position and don’t let your hips sag down. Remember….All core all the time! Second, always be sure that your shoulders are down and back. Don’t scrunch up just to get through the move. Once you have this down, try stepping your feet a bit closer to the anchor point to increase the degree of difficulty. Remember to earn your progressions and never start too aggressive. Before you know it, you’ll be doing this exercise with your feet entirely under the anchor point! Good luck! Don’t Commit These TRX Sins! When you begin using new fitness equipment, you always want to be sure you are using it correctly. The TRX is no different. Each exercise on the TRX has its own set of rules that apply, but there are some universal guidelines that should always be followed. TRX calls these the “Six TRX Sins” and they are the most common mistakes made while performing exercise on the TRX Suspension Trainer. Because it is hard to see yourself and correct the execution, it’s always good to grab one of the DHAC Exercise Physiologists to check your form. They will help ensure that you are avoiding these Six Sins. If you remember back from my last TRX blog, there are certain steps you need to take before starting ANY exercise on the suspension trainer. As always, if you have any restrictions or limitations, always check with your physician prior to starting any new exercise. 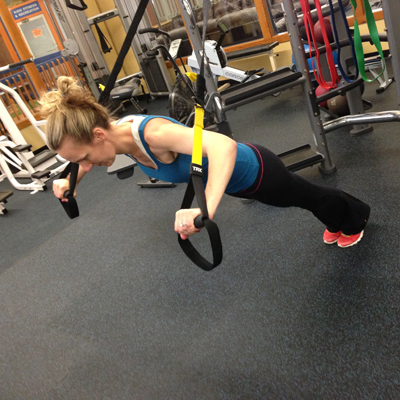 To begin, adjust your TRX suspension trainer to long length. Your position will be SFA, or Standing Facing Away from the anchor point. To start the movement, holding onto the TRX handles, extend your arms in front of your shoulders. Choose your appropriate foot stance. I would recommend starting with a wide foot stance then earn your right to progress from there. Lift your heels off the ground for the entire movement. To execute the movement, maintain plank position and lower your body by bending your elbows to 90 degrees. To return, drive through your palms while squeezing your chest and always maintain plank position. 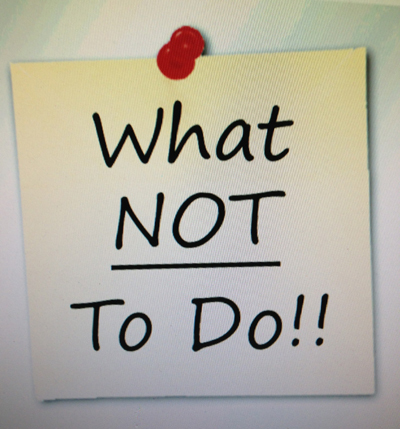 There are two common faults with this exercise that you want to be sure to avoid. One is breaking at the hips. You want to be certain you maintain plank position and don’t let your hips sag down or your glutes rise up. Remember….All core all the time! Second, be sure that the straps are not rubbing up against your arms. Once you have this down, try stepping your feet a bit closer together to increase the degree of difficulty. After that, try standing on one leg while slightly abducting the other leg, then switch. Remember, standing with your feet closer to the anchor point in this exercise will make it more difficult so find what works and progress from there! Before you know it, you’ll be doing this exercise while parallel to the floor! Good luck! So now that you have successfully memorized the anatomy of a TRX, are you ready to workout? Not just yet! We need to discuss the rules of 6:6:3. When we get to the specific exercise portion, you will notice that each move should be performed with the TRX Suspension Trainer set to a specific length. First of all, don’t get frustrated! This was a toughie for even us exercise physiologists to get! Keeping pressure on the foot cradles, roll over onto your hands and knees allowing the feet to rotate inside the cradles. Offset Foot Position This position allows you to unweight some of the upper body during the movement into your lower body. It sounds easier than it actually is. You are not standing with a huge distance between your feet. You are simply stepping back slightly (about toe to heal) to maintain even tension throughout the full range of motion. 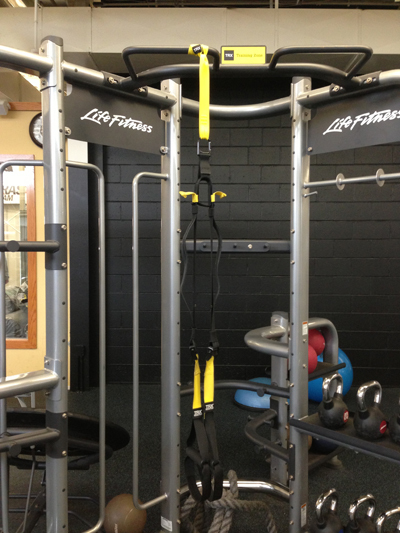 These 3 principles allow you to modify your intensity for any exercise you perform on the TRX Suspension Trainer. There have been a lot of people walking by our two TRX Suspension trainers in the fitness center and well, a lot of you keep on walking! I’m encouraging you to try it out! Yes, it may look intimidating. More than once I’ve had someone say to me “I’m going to get all kinds of tangled in that thing!” But the fact of the matter is that it’s VERY easy to use! The available exercises are endless, but you don’t need to do them all. Start with a few basics moves and take it from there! The best part of the TRX Suspension trainer is that it really is “All core all the time.” Because it is bodyweight training, you can decide at what intensity level you want to work. You can use the TRX Suspension trainer for almost anything including sports specific training, general fitness, improved strength, balance, flexibility, and core stability. Whether you are training as an athlete, rehabbing an injury, training for pure aesthetics, or just want to try something new, the TRX Suspension Trainer is for you! Before we get started on exercises, let’s talk about the components of the TRX. You’ll notice the TRX hanging from a yellow strap. This yellow strap is called the suspension anchor. The TRX attaches to the anchor by its main carabiner. Just below the main carabiner you will see a small piece of material that is connecting both sides of the suspension trainer. This is called your equalizer loop. 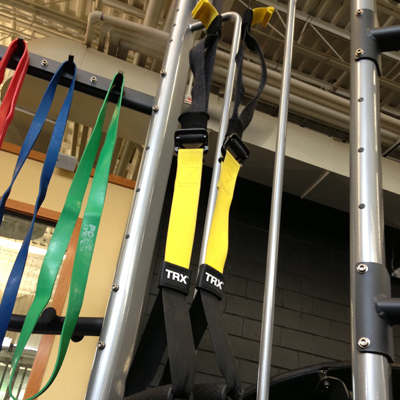 The two yellow tabs you see on each arm of the TRX are called adjustment tabs (you’ll frequently be using these). Lower on the suspension trainer you’ll see a small metal square called your cam buckle. Please note that there are two different designs; one you depress with your thumb while the other you simply angle down with your thumb to change the length of the trainer. Moving down you will see the handles, and below the handles are your foot cradles. Phew….that’s it for now! Next week, we get into some specific exercises. And as always, feel free to ask one of the exercise physiologists for help if you want to give it a go!